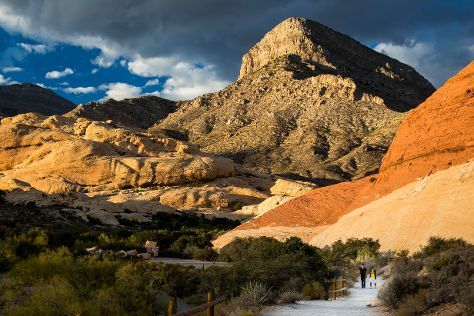 Get in touch with nature at Red Rock Canyon National Conservation Area and Adrenaline & Extreme Tours. Head to The Strip and The Grand Canal Shoppes at The Venetianfor some retail therapy. Step out of Las Vegas with an excursion to Valley of Fire State Park in Overton--about 1h 20 min away. And it doesn't end there: see the interesting displays at The Mob Museum, enjoy breathtaking views from Eiffel Tower Experience at Paris Las Vegas, don't miss a visit to Bellagio Fountains, and see the world from above with a helicopter tour. To see more things to do, where to stay, and other tourist information, you can read our Las Vegas visit planner. If you are flying in from Canada, the closest major airports are McCarran International Airport and Laughlin Bullhead International Airport. April in Las Vegas sees daily highs of 31°C and lows of 16°C at night. Finish your sightseeing early on the 29th (Sun) so you can travel back home.